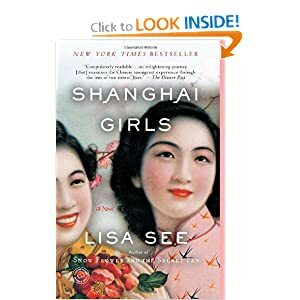 When I read Shanghai Girls by Lisa See, I didn’t put the book down for several days. The book follows the lives of two sisters, May and Pearl, portrayed as selfish, hedonistic young women 1937 in what some referred to as the “Paris of Asia” in Shanghai, China. When the family loses its great wealth and privilege, the women experience some of the worst tragedies imagined. Out of the great darkness comes a light in the birth of the baby Joy. Even though it’s hard to believe one family could endure so much, these hardships are a part of the world’s history whenever one form of government is traded violently for another. When the two sisters finally make it to the land promised to them through their in-laws, chosen for them by their parents, the United States land of plenty only comes to them through their labors. The contrast between the two sisters is stark, but See portrays very well the different perceptions of each even though the story is told through the voice of only one sister. The choice of point of view adds to some of the suspense and tension in the novel instead of switching back and forth between May and Pearl. Pearl, the narrator, misjudges her sister and so does the reader. It’s only through the unfolding conflict that May is somewhat redeemed. In the end, Joy flees the sisters who have raised her and fought over her love throughout the years in California. The book ends with Joy’s departure to find her father, which most likely will lead her back to China, the land her aunt and mother fled years ago. It was on their journey across the Pacific that Joy was born. The ending of Shanghai Girls left me wanting more so it was with relief I found See had written a sequel. I immediately ordered a copy of Dreams of Joy. And just as quickly, I found the story of the headstrong Joy who throws herself at the feet of her real father, an artist still living in Shanghai lacking in the poetry I loved about See’s writing in Peony in Love and Shanghai Girls. See researched both books extensively, but I could not warm up to the character of Joy. Pearl follows her to China, and it is the story of Pearl, who sacrifices everything to return to her homeland to chase after Joy. Her love and devotion moved me because her actions are unselfish and motivated by love. Joy reacts to life’s events without thought of anything but herself. As a result, she ends up in a loveless marriage of her own choosing. In the end, the love of Pearl rescues her. I grew tired of reading the endless scenes of poverty and starvation and cruelty and deprivation. I feel selfish even writing that sentence because these conditions did and do exist for those living under dictatorships couched under euphemisms of social reform and power to the people. Perhaps that was See’s intent with this book – to make the reading of it as intolerable as the conditions she repeatedly shows. Even though I didn’t enjoy Dreams of Joy as much as her other novels, I give praise to See for writing such detailed accounts of historical events that must be remembered lest we forget, and worse, repeat. Novels that entertain and inform stand a chance of making a difference, and I don’t fault her for doing that in both of these books. I just wanted to be swept away by both, and that didn’t happen with the sequel. Two out of three books by Lisa See to transport me, isn’t so bad. Have you read other books by Lisa See? I loved the first two so much, I’m willing to try a fourth. NOTE: Fellow blogger and author Annamaria Bazzi starts a blog tour today for her new release. I interviewed Annamaria and two of her characters from White Swans earlier this month. 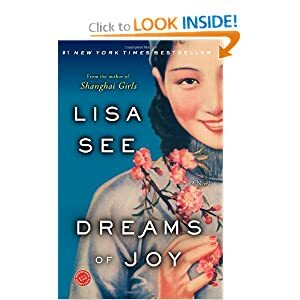 This entry was posted in Book Review Friday, Ramblings of a Writer and tagged amazon.com, authors, characters, China, dictatorship, Dreams of Joy, fiction, Lisa See, novel, Peony in Love, point of view, Shanghai Girls, writers. Bookmark the permalink. I believe See might have done it on purpose so the reader is meant to feel a bit uncomfortable. She’s a powerful and talented writer even though I didn’t warm up to the second book. Thanks for your comments, Hazy.